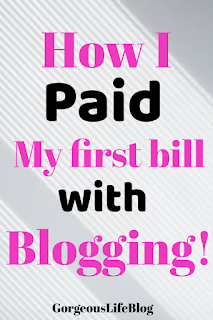 How I paid my first bill with Blogging!! 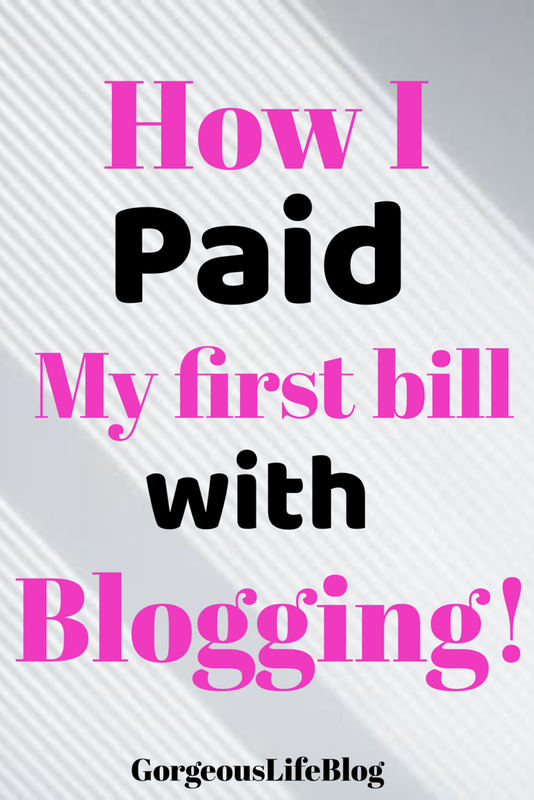 How I paid my first bill with blogging! Hello, beautiful! Welcome back to my blog. If you are new here, Welcome! It’s so awesome to have you. Be sure to get to know me more before you leave and follow me on Instagram, Twitter, or Facebook to keep up with my gorgeous life. I am so excited to be sharing this blog post with you today! The other day I officially paid my first bill with my blog income and I couldn’t be happier! There is nothing better than making money doing something that you love. I started my blog years ago but never took it seriously until last December. It was at that time I decided to go full-time with my blog and try to turn it into a healthy side business for myself and my family. I’m on a serious mission to financial freedom and I understand that the only way to achieve this is by increasing my income and decreasing my spending. **If you want to learn how to start your own profitable blog, check out this post! When I started blogging I did hours of research. Reading other people’s blogs, reading income reports, watching YouTube videos from people who had started off blogging, trying to soak up every bit of information that I could in regards to creating an income with a blog. You see it all too often these days on social media. People saying that they are traveling the world all while getting paid and basically living their dream life. I want to piece of that and I don’t mind working for it. All I had to do was figure out How to Monetize. Most people monetize their blog with ads, sponsored posts, affiliate links, and creating their own products or courses. The problem is that ads can look really spammy. I cannot stand the way they look in a blog. I understand this is normal for bloggers and I’m not bashing anyone who has ads. I just prefer not to have them on my blog. I have seen a couple that are tempted but it’s not a priority. Sponsored posts are harder to get because most companies don’t want to shell out a lot of money to you. So basically I just decided to kind of wing it and maybe try to find the way that was best for me to monetize. I finally was able to make money 2 ways. When I first started my research everyone was telling me that I could start making a healthy side income within 3 to 6 months of solid blogging. Although it seemed a little bit out of reach for someone like me who is starting from scratch, I figured why not try to start making income in that timeframe. Of course, I had my doubts. I’m always worried that I came too late and that the blogging industry is to oversaturated. But I figured I should try anyway just in case I was wrong. It’s those darn income reports that convinced me! Since December I’ve been working really hard on my blog. Writing posts, improving my photography, expanding my knowledge, and trying to create digital products because I knew I wasn’t going to monetize with ads. I wasn’t really expecting to make income. Being able to work from home doing what I love seems too good to be true. I really was surprised by this random opportunity that allowed me to earn a small chunk of money that I could put towards my bills for the first time. During my blogging journey I had joined several Facebook groups that had like-minded people. In the group I came across a random opportunity for a sponsored post. The person who posted the request was looking for bloggers who lived in Virginia. Luckily there aren’t too many of us compared to everywhere else and I was one of the first people to respond. I was given the details of the post, what it would require, the deadline, and the payment I would receive once it was submitted and approved by the client. I was shocked that all of these details were fine with me it was a simple post that I could complete in under an hour. It was something that I enjoyed doing. I agreed to write the post and got to work. I submitted the post the following Monday and I was honestly very worried at this point. You see, the issue with the Internet is, there are scam artists around. I had no idea who this person was. I wasn’t sure why I was trusting her actually compensate for my work. I cross my fingers hoping that it was not a scam in any way. I submitted the post on Monday and I was paid the following morning. It is soooo amazing getting paid to do something you enjoy out of the comfort of your own home. I’m so jealous of the people that are already doing this full time. My goal in the future is to write lots more posts for companies that I love and that would fit my blog and brand. I really wanted to write this post to give anyone out there hope that you can make money online. I didn’t make tons of money, but I was able to put that money immediately towards one of my bills and that feeling was incredible. I want nothing more in life than to be able to pay the bills with something I’m passionate about. Some other awesome news is that I made my first passive income sale recently from a stock photo that I took while having the time of my life in Clearwater Beach Florida. I hope this post encourages you to pursue your online career dreams because there are awesome jobs online. Do you work full time on your blog? Let’s chat! That's really awesome, congratulations! It's always excited when your hard work pays off! This was very encouraging 👏🏾👏🏾👏🏾 Love it! So glad you were able to do that! And ads are something I’m not fond of either so I completely get where you’re coming from with that!! Awesome! Congrats! Every victory, big or small matters! That's amazing! What Facebook groups do you recommend? Congratulations!! I love this post. Thank you for sharing that with us. I’m just starting to build my blog up on the side as a way to earn money! It’s motivating to see you achieved what I’m currently aspiring to do. That is so awesome!! I was so stoked when I made my first affiliate sale on Amazon! This is really encouraging. I am a new blogger and I really don't want spammy ads on my site. Thank you for the reassurance. This is very encouraging. I'm in that place now. A new blogger looking for the best most effective way to monetize my blog. Thank you for sharing your story.